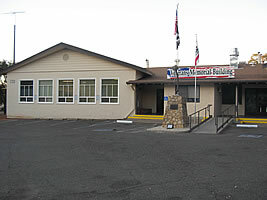 The El Dorado County Department of Veteran Affairs was established by the Board of Supervisors of El Dorado County to assist veterans, their dependents, and survivors in obtaining entitlements from federal, state, and local agencies administering veterans programs. It is not affiliated with the Federal Department of Veteran Affairs (VA). How Do I File A Disability Claim? How Do I Obtain VA Medical Care? Monday- Thursday 9:00 a.m.- 4:00 p.m.
Friday has LIMITED hours between 9:00 a.m. - 12:00 p.m. This office may be closed due to inclement weather and road closures, please call our office to verify. Closed for lunch between 12:30 p.m. -1:30 p.m.
Building Manager is available Monday through Friday 8:00 a.m. - 12:00 p.m. only. •Exit at Forni Road off ramp. •Continue to your right, over the freeway on Placerville Drive. •Turn right at Armory Way. •Turn right just before the Fair Grounds entrance, into the rear parking lot of the Veterans Memorial Building. •Continue through the rear "lower" parking lot and enter the upper parking lot, which faces Placerville Drive.